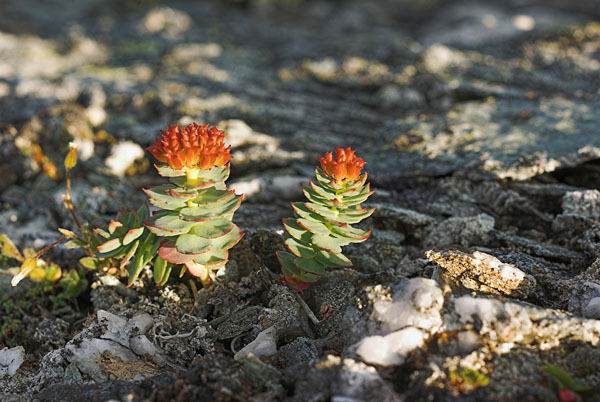 The high elevation above 1000 m, the northern latitude, and last not least the proximity to the ocean, all this combined forms an arctic landscape, with many snowfields still present in August, and their more persistent big brothers - glaciers. 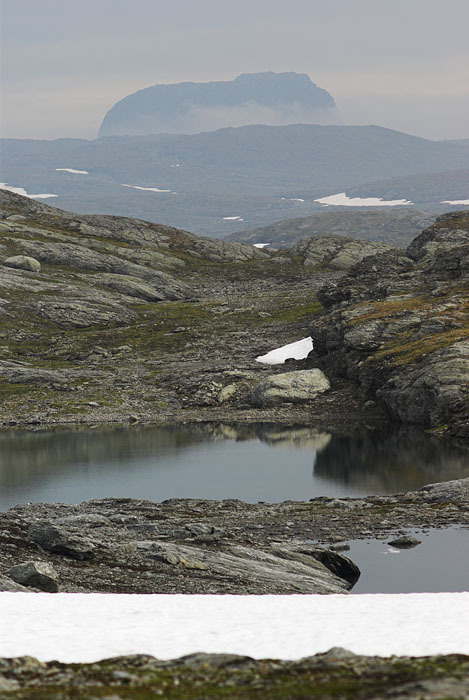 Amundsen used the Hardangervidda as a training ground for his dash to the South Pole. Of course in winter-time, for all practical purposes. 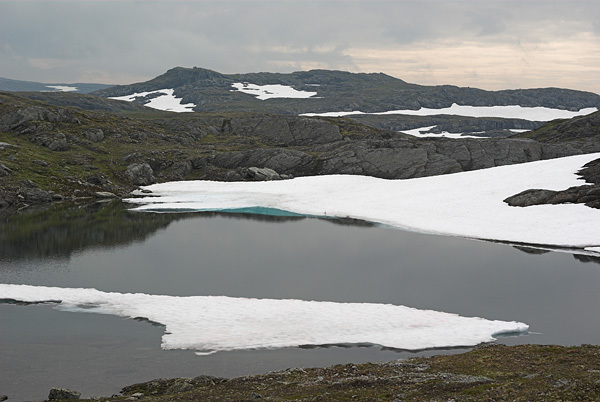 Vatnet is a Norwegian term for "Lake". This one is near the Nonsskorvatnet and too small to carry an own name. 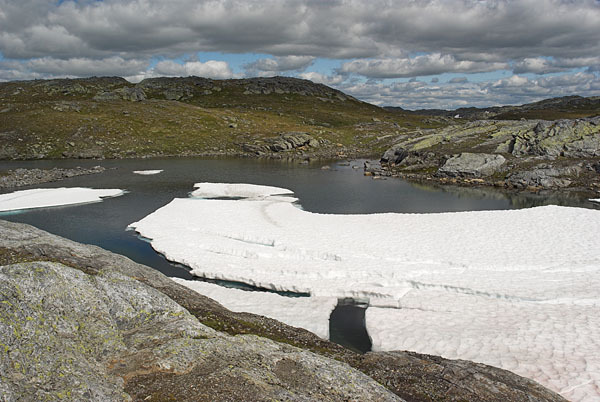 The number of lakes in the Hardangervidda is countless, the land having been shaped by glaciers "just recently", as seen from the geological point of view, and the high precipitation resulting in plentiful of water that seems to be everywhere. 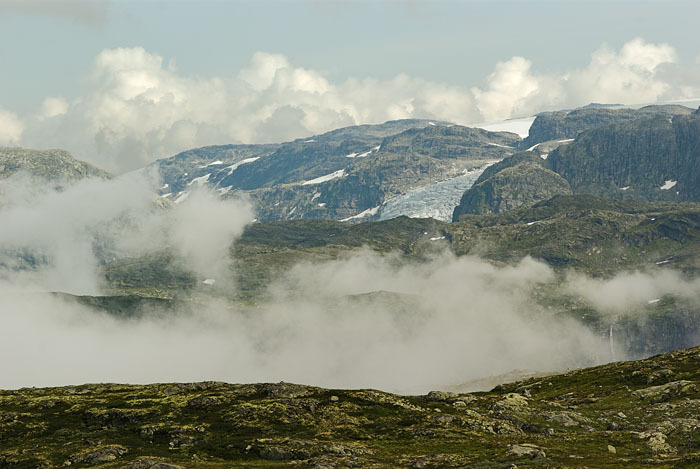 Harteigen (1690 m) rises ghostlike behind low-lying fog, a mountain dominating over a good part of Hardangervidda. Here we are still a day's walk from it. Credit for indentification of the plant goes to a friend of mine. Trees only grow at lower elevations. 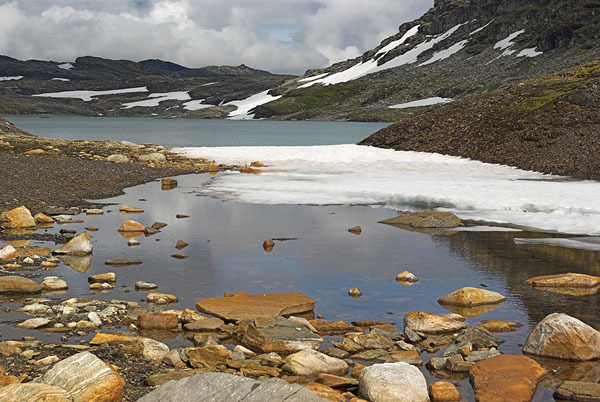 Above 1000 m it is only tundra, lakes, if not bare rock. The commercial use lasts on two species: sheep and hikers. And maybe the extract of the aforementioned plant. 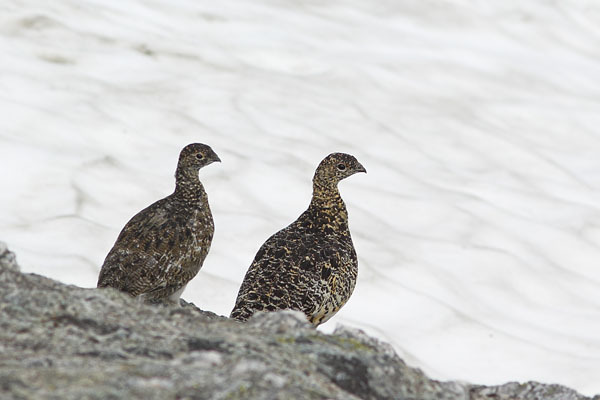 Two ptarmigans, somewhere in between curiosity and respect in presence of the strange visitors. Harteigen seen form the north, from the hut at Hadlaskard. 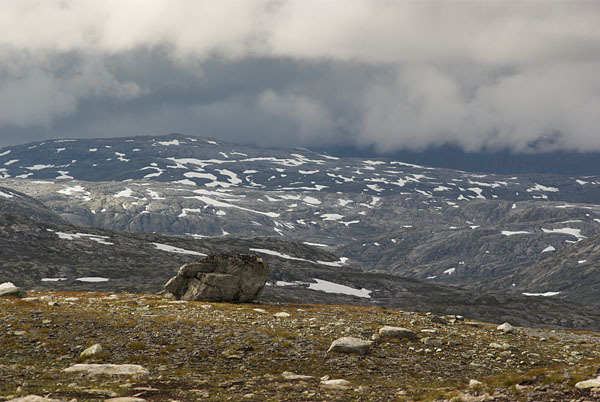 The terrain north of Harteigen is of a lower elevation and hence dominated by green tundra rather than snow. 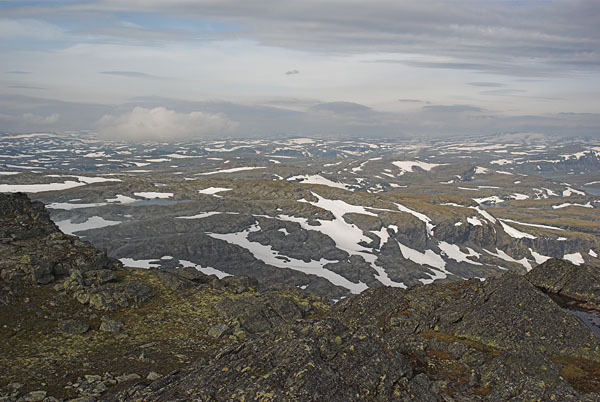 The arctic wastelands to the south seen from the summit plateau of Harteigen. Visibility is, more often than not, limited by the weather. The only "civil" route to the summit leads over boulders and then follows up a narrow chimney on the eastern flank. The mountain stands out like a fortress, and likely a fortress would have been built on top if it hadn't been in the middle of nowhere. Seen form the north. Before noon fog crept up the fjords and we did not hurry so as not to miss the best views. 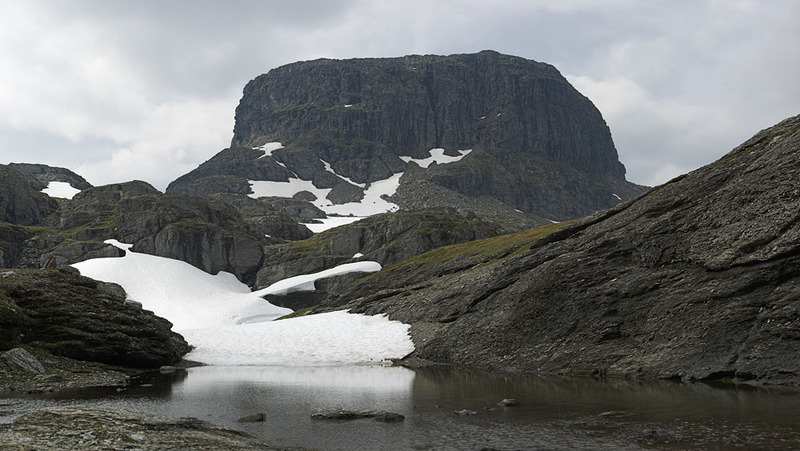 Simadalen is the dry extension of Simadalsfjorden; a short tongue of the glacier that has carved the valley into the rock is still creeping down from the ice-cap of Hardangerjokulen. Simadalsfjorden more than a kilometer down below. 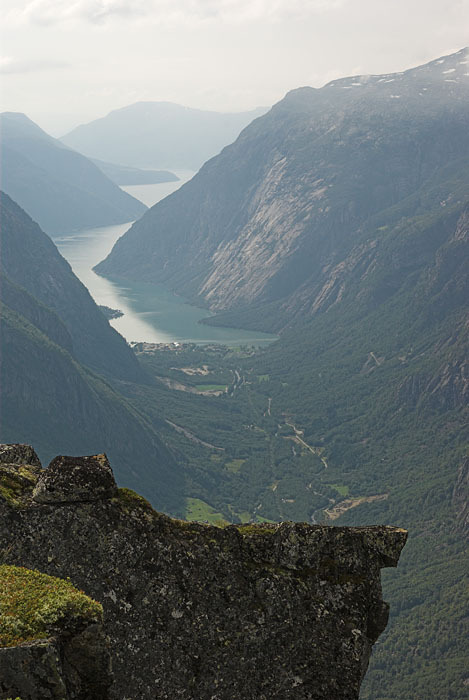 It's still a long way to the open sea, during which the fjord changes its name several times. 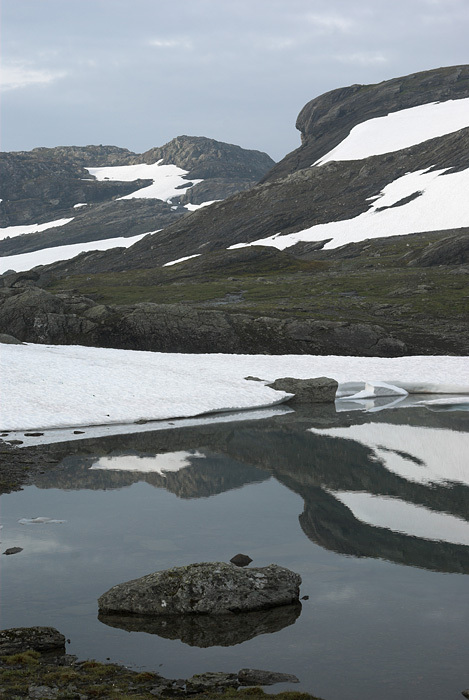 By no doubt this is the most beautiful tongue reaching down from Hardangerjokulen, at least so far as I have seen. 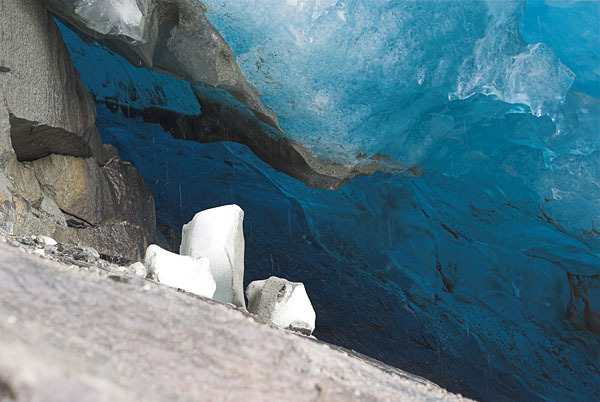 Ice of a deep blue color in crevasses and hollows in contrast with white snow and grayish dirt. 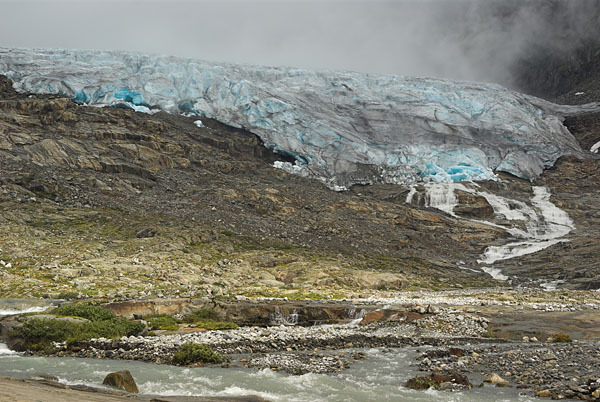 After the somewhat lower land north of Harteigen the country rises to even higher elevations, resulting in the ice-cap of Hardangerjokulen. 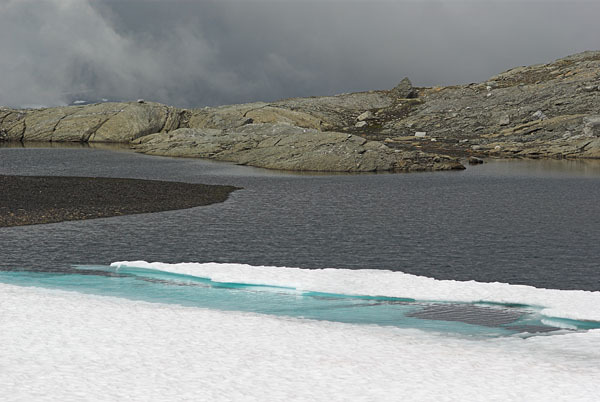 These photographs show lakes just west of the glacier. While having no statistic data I got the impression that bad weather is predominating, including snowfall even in August. 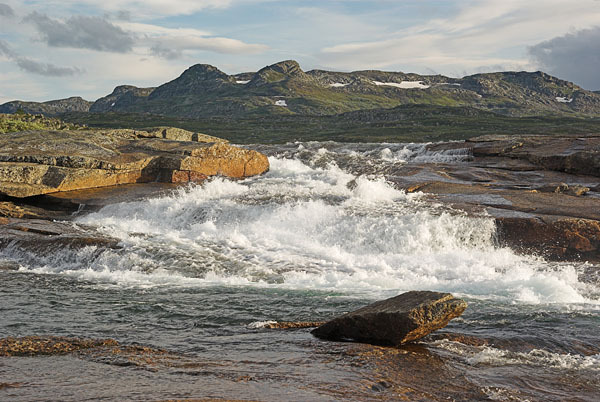 Rapids of a river upstream from Hadlaskard. Many rivers are too big to be safely crossed by foot. Bridges give assistance to hikers along the popular routes during the main season. Voringsfossen from the viewing point near the hotel Fossli. 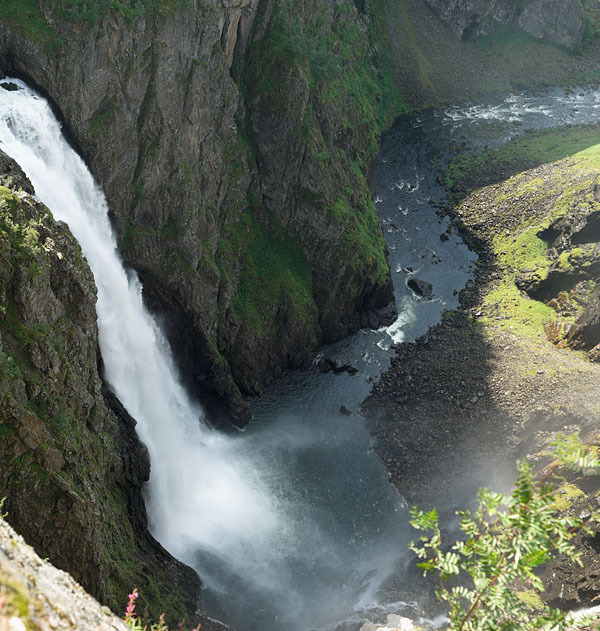 With a free-falling height of about 145 m it is one of the major falls and attracts many tourists, especially as a road makes it an easy victim even for cars and busses. 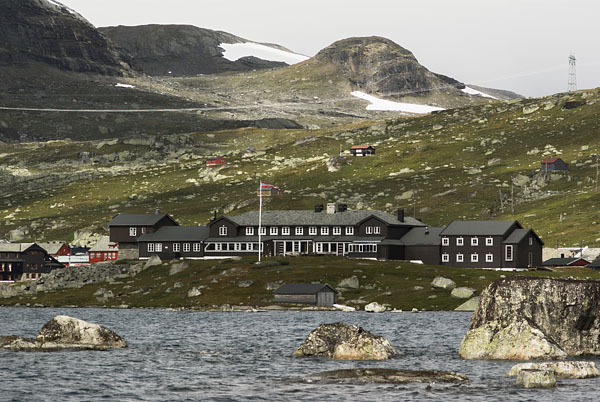 Who thinks that it is just about half a day to walk from the terrible cold rocky highlands to the safety of the railway station at Finse? 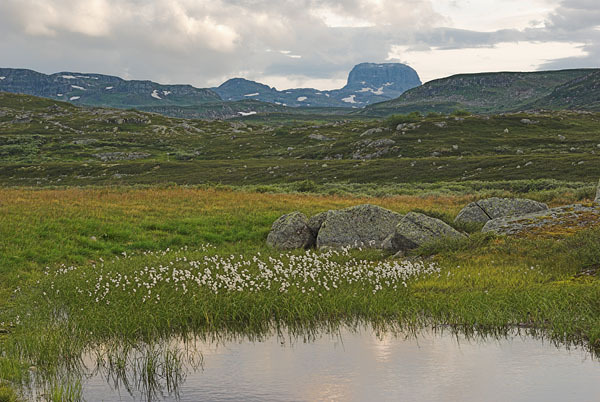 As a station of the Bergenbahnen, the train connection between Oslo and Bergen, it is a good starting point for hikes into the Hardangervidda. In addition to hiking it became popular to ride on bicycles on the dirt road that was built parallel to the railway, which makes the huge Finsehytta once again too small for the many visitors.